Brawler Champion Ale | Yards Brewing Co. The most approachable of our ales, Brawler is malt forward and delicately hopped for a knockout flavor. Its smooth character, hints of caramel and toast, and remarkable drinkability define this ruby colored brew as a true session ale. Perfect when you want to go more than a few rounds. Toasty, caramel aromas. Mild, light beer low on the bitterness. Deep brown color thin lace that dissipates. Very good beer but didn't make me pugilistic. Thanks a good thing since I'm enjoying this at Philly airport waiting for my flight to Europe. Wouldn't want to start a scrap. Am I the only one here who gets chocolate ice cream? Both in the smell and the taste I get so much of like a Haagen-daz chocolate. Maybe it’s just me. Easy to drink beer but not much else stands out than chocolate to me. Look: Mild chocolate brown with a small tan head. Smell: Very mild toasted malt. Taste: Bready malt with a bare hint of hop bitterness. Mouthfeel: Average thickness and carbonation. Overall: A rather dull ale, albeit drinkable. Pours to a creamy beige head and medium to dark brown. Light and low CO2. True to style. 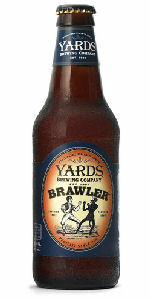 Brawler Champion Ale from Yards Brewing Co.